Single molecules of the giant protein titin extend across half of the muscle sarcomere, from the Z-line to the M-line, and have roles in muscle assembly and elasticity. In the A-band titin is attached to thick filaments and here the domain arrangement occurs in regular patterns of eleven called the large super-repeat. The large super-repeat itself occurs eleven times and forms nearly half the titin molecule. Interactions of the large super-repeats with myosin are consistent with a role in thick filament assembly. 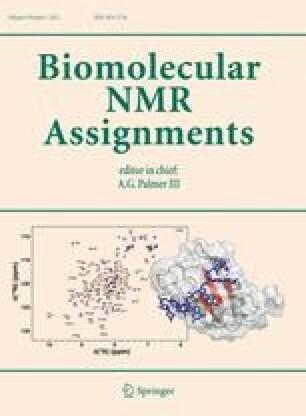 Here we report backbone assignments of the titin A67-A68 domain tandem (Fn-Ig) from the third super-repeat (A65-A75) completed using triple resonance NMR experiments. This research supported by a grant from the British Heart Foundation to SWH and JT.